USB drives have become the preferred method to easily store and transport digital content. This unique custom case provides an extremely impressive presentation which has applications in both business and creative fields. It also makes a great gift and is the perfect companion to our Family Archive Scans service. For the professional wedding photographer, the USB Presentation Case is stylish way to deliver a completed job and keep those referrals coming. From the outside it gives the illusion of a small hard cover book. The thick spine and cover are custom printed on both exterior and interior surfaces. It is protected with your choice of a glossy or matt lamination. When opened, you are presented with the USB drive cleverly inserted into a die-cut foam opening. Let our professional design staff create a one-of-a-kind USB Presentation Case for you. We offer a basic layout option for $25. This includes an image on the front cover, back cover, and inside cover as well as title on the front cover and spine. 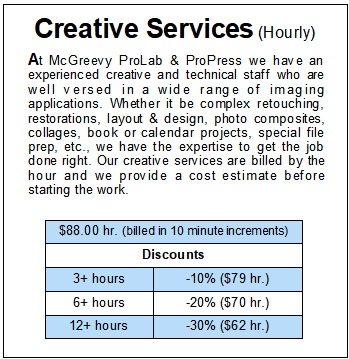 If you require a more complex design, our in-house design service is $88 per hour. You supply a rough mockup, images/logo and text, we do the rest. We will provide a cost estimate before starting and an email approval when the design is complete.